At 79 Wistful Vista there lived Fibber McGee, a fast talking man who was prone to exaggeration. Although he had radio audiences laughing for almost 25 years, his long-suffering wife, Molly, insisted, "T’aint funny McGee." This incredible comedy featured an onslaught of outrageous characters. Also inhabiting Wistful Vista were blustery neighbors like Throckmorton P. Gildersleeve, a pesky little girl named Teeny, the snobby Mrs. Abigail Uppington, Greek restauranteur Nick Depopoulous, and subservient husband Wallace Wimple. Then, there was the McGee’s notorious closet, which seemed to take on a life of its own. 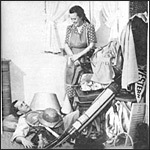 (4/7/1942) RUMMAGE THRU CLOSETS FOR GOV'T DRIV. (2/13/1945) FIBBER, THE PIANO TUNER? (3/18/1947) What's Going on Outside the Drugstore? "Fibber, The Author - Part 1"
"Fibber, The Author - Part 2"
"Fibber, The Sculptor - Part 1 "
"Fibber, The Sculptor - Part 12"